You have made your mind up by now about Colin Kaepernick: rebel, rabble-rouser, revolutionary, dumb and disrespectful disgrace, patriotic dissenter, NFL ratings saboteur, spoiled millionaire who should stand up, shut up and play football, etc. Nothing written in a sports column is going to change your opinion. Nothing Kaepernick does now that he is again the 49ers starting quarterback is likely to change your opinion. Kaepernick has had an impact. Other NFL players have begun kneeling or gesturing during the national anthem. Athletes in other sports and at the college and high school levels have followed suit. Everyone from President Obama and Donald Trump to Supreme Court Justice Ruth Bader Ginsburg and Mike Ditka have offered opinions. His protests have garnered more attention than your typical picket at the courthouse steps. Kaepernick is about to get more publicity. Backup quarterbacks are curiosities who disappear at kickoff. Starting quarterbacks are newsmakers. You will be hearing more about Kaepernick the player and activist for a while. Since he was already on the cover of Time magazine, that means you will be hearing even more about him. Nobody knows where this is going. Not Kaepernick's supporters, his critics or anyone else. The protests have generated editorials and sound bites. They have inspired and outraged. They've raised awareness, for whatever that's worth when rubber meets road. But what are they really accomplishing? Where do they lead? And when do they stop? Not on Election Day: Kaepernick is not a fan of either candidate. When police officers and Black Lives Matter protesters join arms and sing "It's a Small World" in the streets? Probably not going to happen soon. Everyone has an opinion on Kaepernick, but few are qualified to assess whether his protest will amount to anything more than a lot of quickly forgotten chatter. We can analyze his performance as a quarterback. But how is he doing as a protester? "He's showing a very intuitive grasp of activism," said Dr. Micah White, co-founder of the Occupy Wall Street movement. "He's a very good activist. I see resonance with what he's doing." "That's not enough. That's easy stuff." White is the author of The End of Protest: A New Playbook for Revolution. The book recounts the lessons he learned from Occupy Wall Street, a movement that mobilized hundreds of thousands of protesters to establish temporary settlements in financial districts around the world in the autumn and winter of 2011. The protest, which went from an idea in the minds of White and co-founder Kalle Lasn to a national phenomenon in just two months, attracted worldwide attention for weeks but ultimately crumbled due to a combination of subtle pressures (lack of clear goals, brutal weather) and not-so-subtle ones (tear gas). So while you may disagree with White's politics, he knows how public protest works. And how it doesn't work. "Occupy Wall Street teaches us that activists have been chasing an illusion, a false storyline of how social change happens," White said. "That storyline is that if we can just mobilize enough people to make our voices heard, our government will have to listen to us. We're realizing now that's not actually true." It's a lesson that directly applies to Kaepernick and others who kneel or gesture during the national anthem. "You could have every single football player not stand for the national anthem, but it doesn't give them power." The problem with marches, sit-ins and other traditional forms of protest, according to White, is that they have become traditional. Those in power have found ways to neutralize them or tune them out. Kaepernick's national anthem protest was new and novel, catching the NFL and the nation by surprise. Surprise is an important component of successful protest. But a problem arises for the protester when the novelty wears off. "At the end of the day, not standing for the anthem doesn't gain any political power," White said. "It can inspire people. It can spread a meme. But it's ultimately a dead-end behavior. "Ultimately, it's just going to become boring. If you stand or don't stand, America still exists." The anthem controversy was already starting to shuffle down to the bottom of the news stack. There are plenty of other sociopolitical issues to talk about these days. Television broadcasts have begun to compartmentalize images of kneeling players and conversations about the protest to the dull moments in the middle of games. Kaepernick's protest was becoming a Deflategate-like background headache for the NFL and a footnote on the evening news to whatever was leaked about a presidential candidate last night. Kaepernick's promotion to a starting role and Bader-Ginsburg's comments have reignited interest/excitement/scorn about the anthem protests. But even if Kaepernick returns to 2012 form and leads an unlikely playoff run, that interest will likely fade. "He has a window of opportunity. But it may be closing," White said. White, who is now running for mayor of a tiny Oregon town, stresses that 21st century protestors must strive for sovereignty, the political or financial power to make the changes they seek. He feels that successful modern movements must act more like a cross between protests and political parties. They shouldn't just march in the streets, they should also put names on ballots. Probably not a great idea. White warns that such a movement cannot be about one charismatic individual seeking power. 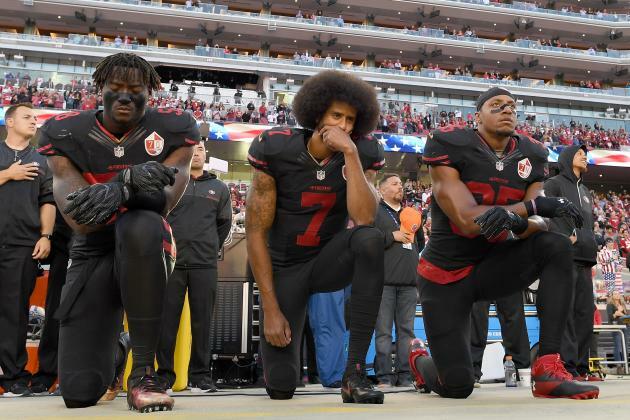 A more effective model for those who support Kaepernick and his cause would be to create an activist network that identifies mayoral and city council races where they can get candidates elected, initiate reforms, appoint police chiefs and so forth. Such a grassroots movement typically needs a spark, as well as someone to rally around. "A celebrity like Colin really could inspire people to do that," White explained. Barring a sudden, unanticipated lurch into such tangible political action, anthem protestors must at least become more unpredictable if they hope to stay relevant. "I would be trying to spread it outside of athletics," White said. "Maybe do it before city council meetings. Try to get someone to do it in congress. I would be trying desperately to move it into different domains." Expanding the demonstration repertoire, though, will only extend the problem of not having an end game. "What happens if everyone starts ignoring it? That's his worst-case scenario," White said. That's a best-case scenario for anyone out there who loathes Kaepernick, despises the anthem protests, takes issue with their underlying principles and is somehow still reading. White's playbook for extending and amplifying Kaepernick's protests can be turned on its head to become a counterstrategy for suppressing and minimizing their impact. That countermeasure may be counterintuitive. Kaepernick won't be silenced by NFL edicts, boycotts, scathing editorials or angry words from coaches or Supreme Court justices. He will be silenced by silence. An ignored protest goes away, or at least fades into the background. And this year's ultimate gesture of defiance becomes next year's historical footnote. When was the last time you saw a tent city outside a bank headquarters? Or even thought about one? For Kaepernick and his supporters, there's a real risk that kneeling during the national anthem will become, like Occupy Wall Street, what White called in his book a "constructive failure." It could lay some groundwork for future movements, perhaps mobilize some newcomers to social activism, but ultimately fall short of accomplishing tangible changes. To avoid that, Kaepernick needs more than some three-touchdown games or another round of twists and turns in the election cycle. "He needs some sort of divine intervention," White said. "The unexpected." That sounds a little chilling, even to someone sympathetic to Kaepernick and his cause. We've all had a little too much "unexpected" in 2016. By Mike Tanier, NFL National Lead Writer. Originally published at the Bleacher Report.